There is a trend of dormant Amazon seller accounts being used for scamming. Previously inactive sellers for years come back to selling with a string of negative reviews. Amazon's automated seller suspension has been improving and catching just launched sellers before they get a chance to do real damage. However by utilizing dormant seller accounts this barrier is removed. 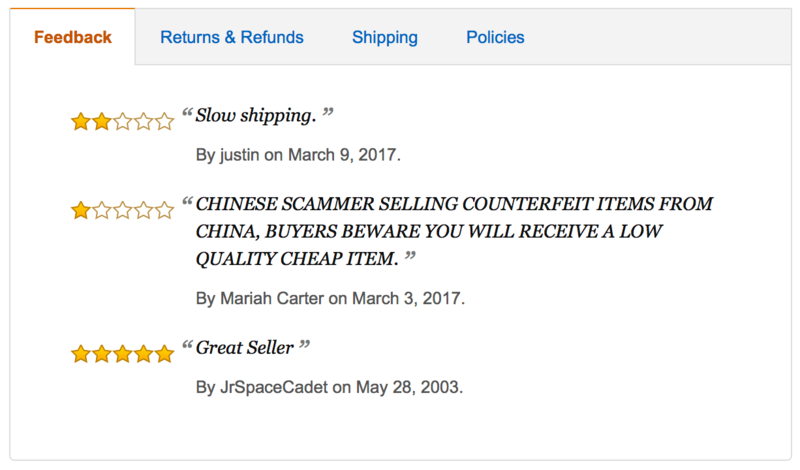 In the sample feedback on the right you can see how a seller went from having a single positive review all the way back in 2003, to having a string of hundreds of negative reviews in the last month. This is a clear indication that it's not the same owner who initially opened the seller account, but instead someone using it most likely after a successful phishing attack or by hacking seller's email and/or seller account. The way we understand it, a scam seller changes the deposit bank account number to their own, and after the first deposit is made they disappear. But when customers start complaining and Amazon automatically refunds their payments, it's the original account owner's credit card which gets charged. So not only are these fraudsters benefiting themselves, they are also creating problems for the original owners who then have to fight with Amazon to get the charge reversed. In this case, it's not just the buyers who need to be beware of scam sellers, but also sellers need to be careful to avoid getting their account hacked. Even if they have no plans to sell in the future.